Judith Orloff 7PM TUESDAY, MAY 13 Judith Orloff, MD: The Ecstasy of Surrender Bestselling intuition expert Judith Orloff presents her new book, The Ecstasy of Surrender: 12 Surprising Ways Letting Go Can Empower Your Life. Orloff asks, "Are you longing for your life to be easier, with more fun and less drama? What if you could enjoy what you have, instead of always lusting for more?" She says that you can achieve this and other lasting positive changes, when you learn to surrender. The Ecstasy of Surrender shows how knowing when to be assertive, and when to let go, is the secret to manifesting power, success, and intuition in all areas of life—including work, relationships, sexuality, spirituality, aging, and health. Surrendering removes roadblocks in your life and the exhaustion that comes from “trying too hard," and helps you achieve goals more effortlessly and joyfully. Orloff says learning to surrender is an invaluable skill for anyone who wants a positive, intuitive way of living that increases power, inner peace, and ecstasy. Bestseller Deepak Chopra raves, "With wisdom, grace and good humor, Judith Orloff's book provides a road map for helping us let go of our fears and anxieties." EVENT DETAILS TICKET (admits two) is free when you purchase The Ecstasy of Surrender from Changing Hands Bookstore. Letter groups (printed on top of ticket) will be called at 6pm to fill seats and designated standing room. If available, seating and standing room opens to those without tickets at 6:45pm. Space cannot be guaranteed for late arrivals. Booksigning line forms by assigned letter group after the presentation. Those without tickets may get their books signed after ticket-holders, if time allows. Event details may be subject to unannounced changes. ABOUT THE AUTHOR Judith Orloff, MD, is an assistant clinical professor of psychiatry at UCLA and is the author of the bestsellers Emotional Freedom, Positive Energy, Dr. Judith Orloff's Guide to Intuitive Healing, and Second Sight. She has appeared on The Dr. Oz Show, The Today Show, PBS, CNN, and NPR, and her TED talk debut of this book has nearly a half million views on YouTube. For more information and inspiration, visit drjudithorloff.com. We're thrilled to be the offical booksellers for The Straz Center's event with Deepak Chopra, in celebration of his new book What Are You Hungry For? Tickets can be purchased here See you there! Please note: Tickets required, but NOT available at Books & Books, only through Broward Center. Books & Books will have books available for purchase at this event, which will be followed by a book signing with the author. After promoting this message worldwide for thirty years, bestselling author Deepak Chopra focuses on the huge problem of weight control in America with exciting new concepts. What Are You Hungry For? is the breakthrough book that can bring weight under effortless control by linking it to personal fulfillment in every area of a reader's life. What Are You Hungry For? Food? Love? Self-esteem? Peace? In this manual for "higher health," based on the latest findings in both mainstream and alternative medicine, Deepak Chopra creates a vision of weight loss based on a deeper awareness of why people overeat - because they are trying to find satisfaction and wind up using food as a substitute for real fulfillment. Repudiating the failed approaches of crash dieting and all forms of deprivation, Chopra's new book aims directly at the problem of finding fulfillment. When that problem is solved, he argues, normal eating falls into place automatically, and the entire system of mind and body achieves what it really desires. “Everyone’s life story is complicated, and the best intentions go astray because people find it hard to change,” writes Chopra. “Bad habits, like bad memories, stick around stubbornly when we wish they’d go away. But you have a great motivation working for you, which is your desire for happiness. I define happiness as the state of fulfillment, and everyone wants to be fulfilled. If you keep your eye on this, your most basic motivation, then the choices you make come down to a single question: “What am I hungry for?” Your true desire will lead you in the right direction. False desires lead in the wrong direction.” Wherever you are in life, this book will help point you in that right direction. He has written more than 55 books including Ageless Body, Timeless Mind: The Quantum Alternative to Growing Old (1993); Boundless Energy: The Complete Mind/Body Program for Overcoming Chronic Fatigue (1995); Creating Health: How to Wake Up the Body's Intelligence (1991); Creating Affluence: The A-to-Z Steps to a Richer Life (1993); and The Seven Spiritual Laws of Success: A Practical Guide to the Fulfillment of Your Dreams (1995). He has won numerous awards including a Quill Award for Peace Is the Way and the grand prize at the 2005 Nautilus Book Awards for The Book of Secrets. He also writes novels including The Return of Merlin (1995); Soulmate (2004); and Jesus: A Story of Enlightenment (2008). 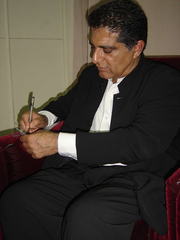 Deepak Chopra has written 26 books, which have been translated into 35 languages. He currently serves as CEO & founder of The Chopra Center for Well Being in La Jolla, California. Deepak Chopra is currently considered a "single author." If one or more works are by a distinct, homonymous authors, go ahead and split the author. Deepak Chopra is composed of 27 names. You can examine and separate out names.